Pen - Bristol - Ballpoint pen with flat top. 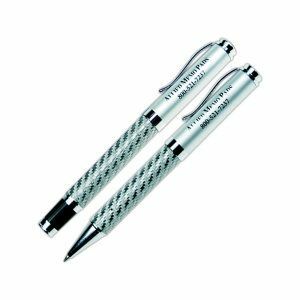 The Bristol Metal pen has a silver weave look with a twist ballpoint. Available with blue or black ink cartridge. Mirror Laser Engraving available at no extra charge. Tags: Bristol - Ballpoint pen with flat top.